Today’s project: retire a wheezing Netware server and replace it with a new SBS 2003 server, and toss in some new XP workstations so we can recycle the Win98 boxen. Yep. That’s what I said, too. Thankfully, they don’t have tons and tons of data, because it took most of the day (somewhere around 4+ hours) just to copy the data off of the old server to a workstation. Let me say that again: 4+ hours to copy over 4 gigs of data. To contrast: when replacing the workstations, I yanked the 4GB hard drives out of the old boxen, hooked ’em up to the new XP box with an IDE-to-USB converter, and copied the drive wholesale in under ten minutes. If only I could have done that with the Netware drives. So as they sit right now, the new workstations are in place, the server is in place, but I haven’t configured DHCP or anything so nothing is talking yet. That will be first step tomorrow. The really fun part is the Line-of-Business software. Installation is apparently pretty easy, but getting a hold of the vendor to find this out took all day. I started calling him at 9 this morning, and he didn’t get around to returning my call until after 6pm – which was 9pm for him, he being on the East coast. Now it’s three hours later, and I am still waiting for him to email me with the download link so I can get the updated installer and instructions. Comments Off on It is high-time, apparently. New toys…er, I mean Tools! To expand upon what the WBGF gave me for starters, we went to the Oregon Leather Company on Saturday and I grabbed a big bag o’ tools for me to hurt myself with. Because, really – what project is complete before the obligatory blood sacrifice? Mechanics, woodworkers – you all know what I mean. A barked knuckle on the head while removing a bolt, or that nasty splinter in your palm while prepping your latest shelving project? Yeah, there will be blood if there are tools involved. Knowing this, I decided to prevent as much of that as possible by turning the first use of these new tools to making scabbards for said tools. The Skiving knife, with it’s bare razor blade was a must. The last thing I want to do is reach into the tool kit and take half the flesh off my hand on the way back out. That one was pretty simple, just a folded over swatch of leather with a rivet and a snap. 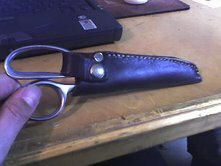 My new leather shears ran a distinct chance of bashing themselves against my miniature anvil, so that scabbard was more to protect them than me. This one was a good starter project, as it includes all of the basics: designing, cutting, sewing and rivets / fasteners. I tried two types of stitching, to get a feel for which one would be better in the long run. First, I tried with the Speedy Stitcher sewing awl, which was definitely the easier of the two, but I don’t like the look of the back-side of the stitch. This may be improved with experience, though. More experimentation is required. The second method, a saddle stitch, looks the same both front and back so it will be the one to use if both sides are visible – but this method is slightly more difficult and more likely to lead to me sticking a needle into myself, which is exactly what I did. Twice. Unlike a regular cloth needle, leather needles have a triangular head, which is sharp for almost a centimeter. This means you bleed more when you stab yourself. So as usual, bandages in the toolkit. Comments Off on New toys…er, I mean Tools! Client emails us in a panic because his email server for their sub-company is down. He has no idea why, it was working fine the day before and he hasn’t been messing with it. I spend most of the day bashing away at it, can’t find the cause. Serendipitously, Comcast finally comes through with the second feed and new IP address so we can move this project out from under the main business and onto a separate firewall. Mail is already dead, the users won’t know if we move stuff around so we go with it. I re-write all of the firewall rules in record time, (That CSSA course paid off!) and disable all the rules for this project in the main firewall. At the time, I notice something I think is a little odd, but move on. I make the changes to DNS at a quarter to five. Nothing to do now but wait and see. Go home, scrounge some dinner, zone on some tv, splatter about 500 zombies and generally turn off. My subconscious percolates. Just a few minutes ago, Bam! that oddness in the firewall comes back into focus and I realize one of the rules I had disabled in the main firewall was the killer. Check the mail server, and thar she blows! Email for all! The question now is, was one of our guys mucking around in there, or was this a 1st Rule violation? My money is on the fish. So, what with my birthday being last week, I’ve been a little distracted and not posting. There was also lots of work for us to catch up on after having had the long weekend, so what free time I have had has been going to other projects. One of the things I thought about out loud in front of the WBGF was that the cost of leather goods on merchant row at the last event was getting pretty ridiculous. Merchants were asking up to $45 for a simple pouch! Having done leatherwork before, I know it is not terribly difficult, so I thought I might take it up again as a hobby – something I could take with me to do at events to while away those long daylight hours when nothing interesting is going on. She being the Best, she was of course listening to me ramble on and did something about it by gifting me some leather tools and practice material to help me get back my mad skillz. So, I’ve spent some of my free time over the weekend playing with new toys and remembered more than I thought I would have. The first project was just a simple mug-hanger (a loop of leather that goes around your belt and hooks through your mug’s handle), but it was enough to get me back in the mindset and tell me what tools I need to finish out the workshop. Since payday isn’t until tomorrow, I spent the rest of my time mentally dis-assembling the rest of my leather accoutrements and making patterns for when I do have the right tools. So far, I have a better mug-hanger (because Tolerant needs one), a pair of basic pouches (these too!) and a new sheath for my right-hand knife (which I have wanted to replace for years).